"I guess we'll be late to the art show," I say. You smile. "That's okay," you say. “But let's turn into this parking lot before we worry about that," and you point to the right, toward the parking lot where the convertible had turned, and then you reach over and press the hazards button on the dash. I nod and move my foot from the brake and step lightly on the gas, forgetting my right blinker. You signal to the truck behind to copy us. Its driver gives you a wave and turns on his right blinker. I turn my car slowly, following the delineated lines of yellow paint on black cement. The truck turns behind me. I park. We open the doors and step outside. I stretch, raising my arms above my head, and as I do, I notice that we have parked in a strip mall, and I am standing across from a fabric store. Then I walk to the rear of the car to examine the damage. Miraculously, there's nothing to see but a small dent in the trunk, where the silver paint chipped and the metal bent on impact. "This car is a tank," you say. I smile and take a big breath. "Thank God,” I say. You nod. “We should try to open trunk,” you suggest. I press the button, and the lid pops up. I smile, shaking my head. “I normally hate this old beamer, but I guess those German engineers know how to build a car,” I say. You chuckle. "I'm so sorry!" the driver of the truck says, walking up to us. He had parked a few spots away, across the parking lot. I study the truck: it's painted blue with a decal on the side of cartoon clothes: a laundry delivery service. The driver is a young guy, and he's rubbing his forehead and face with his hands. I see a bead of sweat on the end of his nose. "I can't believe it," he says. "Do you mind, um... well, what’s your name?" I ask. "I’m Joe,” he sticks out his hand. I shake it. “Jeremy,” you say, holding out your hand, which he grasps. "Can we get your insurance info.?" I ask. "Yeah, yeah, of course," Joe says. "I also gotta call my boss. It’s their truck, so…” It occurs to me that he might lose his job, which is why he can’t keep still, and I feel pity for him. "Sure, sure," he says, and walks back to the truck, opens the door, and rummages in the glove compartment. He walks toward us again. "It's here," he says, and he hands me a piece of paper. “Thank you, Joe,” I say. Then I walk to my open my car door and sit down. I can feel my hands trembling, and I shake them, then tighten them both into fists, then open them wide, stretching the fingers: they're still shaky. I reach into the pocket of the door and find an unused napkin from a recent Chick-fil-a trip. I open my purse and feel around for a pen. Then I rest his insurance card on my left knee and, balancing the napkin on my right knee, I copy down the information. You open the passenger door and sit down beside me. "Do you want me to call the police?" you say. "Oh. Uh…" I say, double-checking the phone numbers I’ve copied down, "I don't know. What do you think?" "Well, that's up to you," you say. "I don't think it really matters," I say, still writing, "I can just call my insurance and there's not that much damage." "I guess not," you say. "But I mean, I feel a bit sore." I look at you. "Really?" I say. "Probably from the impact," you say. "It's my back." "Gosh, sorry," I say, looking down. "It wasn't your fault," you say. "How are you, by the way?" "That's the adrenaline," you say. "I don't feel sore yet, but I was looking backward when he hit us," I say. 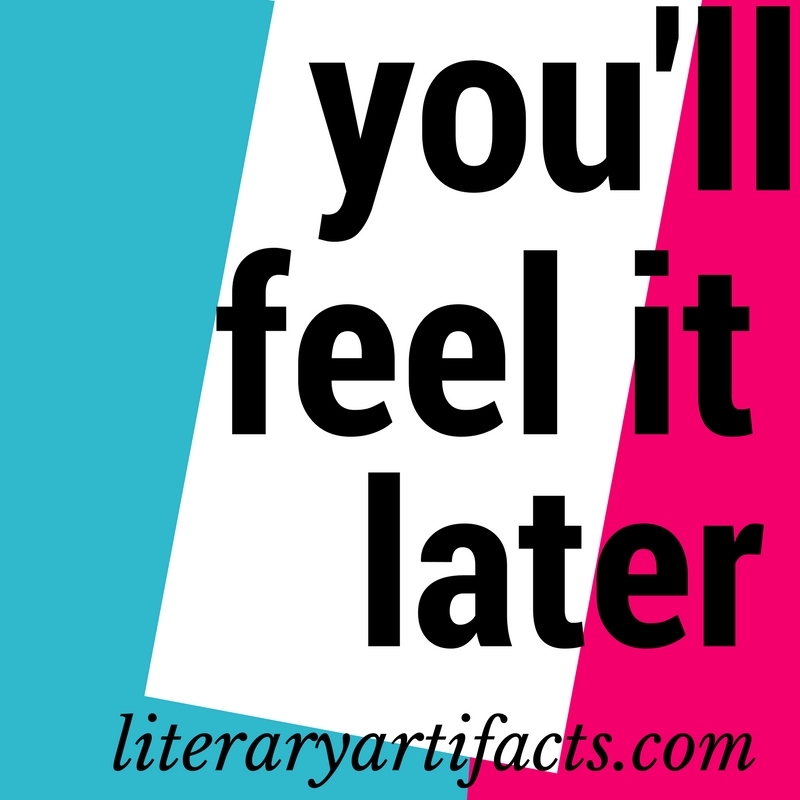 "You'll probably feel it later," you say. I sigh. "You know what, I don't want to call the cops. I want to go see some art and then go to the conference and listen to some live jazz with a glass of wine in my hand. I want to have fun tonight. Is that okay? Is that stupid?" You laugh. "I think it’ll be fine," you say. "I'll be your witness to what went down." "Thanks," I say, and smile at you. You smile back. "Well then, let's get going,” you say. “You have that information copied down?" I nod. "Alright. I'll give it back to him and get his boss's name and number, and we can give his boss a call later this weekend. Sound good?" “Sounds good,” I say, smiling. You turn and smile. “I am,” you say, and once you've turned toward Joe, chattering into his cell phone as he leans against his truck, I grin like I've just won the lottery. After all, this is just day one of our weekend extravaganza, and who knows? Anything could happen. I am writing and serially publishing scenes from my falling-in-love memoir, about the anguished, beautiful, and spiritual way that my husband and I met, fell in love, and married. Read about my plans for this in-progress writing project here. Read my writing in your inbox: SIGN UP for my email list or FOLLOW me by pressing the button on the footer. And don’t forget to SHARE this story with the hashtag #fallinginlovestory!